On your first visit to our office you will be welcomed to the world of chiropractic and you will be greeted with a warm smile by Shalene, our office manager. You will then be asked to fill out forms which will help us gain some information about yourself and your condition. Dr. Randall Trester will then discuss with you your situation and ask you some specific questions regarding your condition to determine if chiropractic care may be of benefit to you. If the doctor can help you, the doctor will let you know. Nothing will be done in our office without your consent. After a thorough consultation with Dr. Trester, you will have a complete chiropractic examination. This will include testing your reflexes, your ability to turn and bend as well as other standard orthopedic, neurologic, postural, and physical examinations. The doctor will gain valuable information regarding your condition so that a better understanding of how chiropractic can help you. If necessary, the doctor may take X-rays or refer you for additional testing procedures. 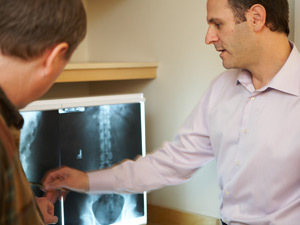 An X-ray is usually required to get a full evaluation of a patient. The need for X-ray is considered on a case by case basis. Our equipment is state of the art for imaging and is done on-site. Once all the information and examinations have been performed, Dr. Trester will sit down with you to give you a report of findings, discuss your X-rays with you and share with you his recommendations for a treatment program. At this point he will be able to document the frequency of visits and the time frame required to achieve desired results. Most of our patients begin to see results from the very first adjustment. Our special gentle yet effective alignment of the body is interactive with the patient, gentle enough for kids (they love us), yet able to restore function and movement for the athlete and senior. Dr. Trester will check your alignment both before and after the treatment. You will start noticing remarkable results after each adjustment. You will look forward to each visit at the clinic.